2.33 p.m. R5 12 Fly to the Moon (4 m Reliable Man – Fly Silca Fly, by Hawk Wing) – Jake Bayliss; was given an easy time when rearward in the Rating 65 1600 metres on 29 August at Matamata, following a seventh in the worst going on the inside over a mile at Pukekohe. 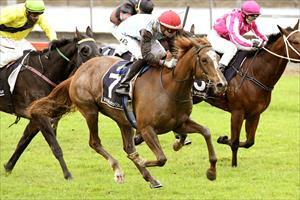 She looked good winning three starts ago and steps in grade and distance for $25,000 Rating 72 2100 metres. Fixed odds: $21.00 & $5.00. 3.14 p.m. R6 7 Resurrect (6 g Shinko King – Errant, by Jungle Pocket) – Jake Bayliss; has met one better at his last three starts, finishing second each time, and steps in grade to contest the $35,000 Open 1200 metres. Dropping in weight to 54.5kgs appeals, but he meets a strong field and required to appreciate the course at his first attempt. Fixed odds: $10.00 & $2.60.